At Surface Squared we know that educational facilities have evolved to become highly flexible learning environments. We aim to provide architects and designers with a range of materials that support and maximise learning spaces. 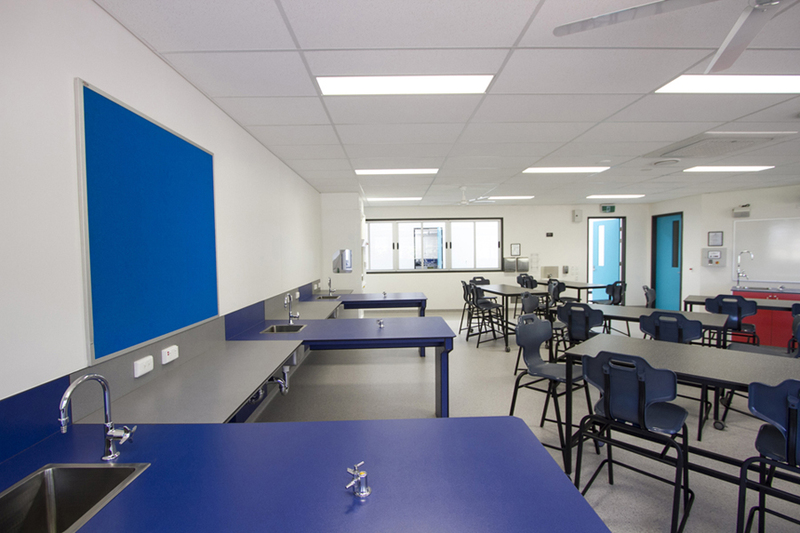 As part of our educational range the colours below in a Zodia finish provide 10mm “self-supporting substrates” for bench tops as approved for Queensland Department of Education and Training facilities and are used throughout education projects nationally. Need to specify Substrates in Science, Medical and Research Laboratories? We encourage you to engage with Surface Squared for a SOLUTION to use in application. You provide the working and environment parameters and we will support you with a solution. If you would like more information, contact our expert team on: 1300 722 113 or info@surfacesquared.com.au. The image below shows a school class room, a high traffic environment where students are actively relying on the mechanical and physical properties of the self-supporting substrate to sustain the demanding conditions of use. The bench tops fabricated with10mm SURPAC allow the precise lines of thin section steel frames for support, creating an appearance in the room that space is vast and unencumbered. It’s a radical choice to engage a material which challenges a traditional design approach of using a thicker 18mm MDF + Particle Board joinery. Change room, locker and partitioning solutions. Improving privacy and safety with full height bathroom cubicle’s is becoming more of a design requirement across education facilities, office buildings and public spaces. At Surface Squared, our suppliers can produce a material over 4 meters in length. This provides the ideal sheet size for full height bathroom stalls. Reducing the gap between the floor and bottom of the stall and making access over the top non-existent or difficult. Delivering a clean sleek finish along with its phenolic core, SURPAC is a low maintenance and hygienic material. Contact the team at Surface Squared for your education pack with all the materials required for your next project!